Startling new findings show acquired changes ‘arming’ the next generation. But it’s no help to evolution. When August Weisman cut off the tails of mice last century, he was trying to disprove a belief held by evolutionists like Lamarck (and Darwin, whom he otherwise admired). That is, that changes acquired during a creature’s lifetime, such as the stretching of the neck from efforts to reach for food in higher trees, could be inherited. None of the offspring of Weisman’s mice had any tail shortening. Thus arose one of the ‘central dogmas’ of modern biology, that changes caused by the environment cannot be inherited.1 However, recent findings have seemed to suggest otherwise. Wild radishes normally respond to caterpillar attack by greatly increasing both the number of protective spikes in their leaves, and the production of natural toxins which make the plant less palatable.2,3 A careful, controlled study has shown that at least some of this resistance to attack is passed on to the next generation. Since inheritance takes place through coded instructions, using the DNA language convention, it makes sense that the environment should not affect inheritance. It seems far-fetched to contemplate any way in which the cutting off of a tail, or the stretching of a neck, could specifically ‘re-write’ genetic instructions. So in general, this ‘dogma’, of information flowing only one way (from the DNA to the rest of the organism), holds true. Do these new findings support ‘Lamarckian inheritance’, and do they suggest a new mechanism for evolution? No, and no. The water fleas have a built-in mechanism to respond via larger helmets within their lifetime. Evolutionists would say it somehow evolved through chance mutations and natural selection. Creationists would say it was designed. Both agree that it aids the survival of the water flea. This may be via the ‘switching on’ of genes which would otherwise be dormant. (Other recent discoveries show that genes can be switched on or off depending on which parent they are inherited from).4,5 If so, the findings discussed earlier may merely show a simple extension to this mechanism—the switched-on genes stay switched on in the offspring. Or else there is a secondary mechanism which switches on genes that are passed on to the offspring. In either case, it is clearly not a random response, but a programmed mechanism—one which helps the offspring to survive and propagate the line. A key point of this new discovery is that even in the parent generation, the environment did not cause the response—e.g. the larger helmets—so much as induce it. In other words, it is not a change caused by the environment, but a pre-programmed response induced by it. So there is no evidence that any new information is generated—it is all there already. The central problem for all evolutionary theories is explaining how all the new information arose to progressively transform microbes, over billions of years, into magpies, molecular biologists and magnolia trees.6 Thus this finding, as such, gives no support to either Lamarckian or neo-Darwinian evolutionary belief. What it does suggest is that there is another level of complexity in living things, which are even more ingeniously designed than previously realized. This makes it even more difficult for those who insist that living things were not designed by an Almighty Creator, but arose by natural processes. Of course, starting from biblical presuppositions would have made this obvious—cf. circumcision. Return to text. 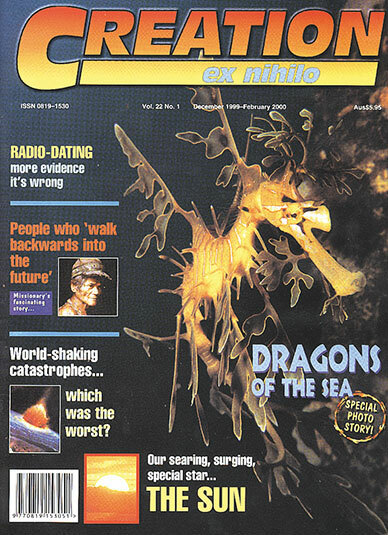 New Scientist, 163(2202):12, 4 September 1999. Return to text. Agrawal, A.A., Laforsch, C., Tollrian, R., Transgenerational induction of defences in animals and plants, Nature 401(6748):60-63, 2 September 1999. Haukioja, E., Bite the mother, fight the daughter, Nature 401(6748):22-23, 2 September 1999. Return to text. Jerlström, P., Genomic imprinting, TJ 13(2):6, 1999. Return to text. Cohen, P., The great divide, New Scientist 160(2164):16, 12 December 1998. Return to text. Natural selection does not add information, it culls it. Mutations can occasionally give a survival benefit, but all examples to date, e.g. wingless beetles on a windswept island, have been losses of information. See the distinguished Israeli biophysicist Lee Spetner’s book Not by Chance! The Judaica Press, Inc., New York, USA, 1996 (see review of Not By Chance!). Return to text.